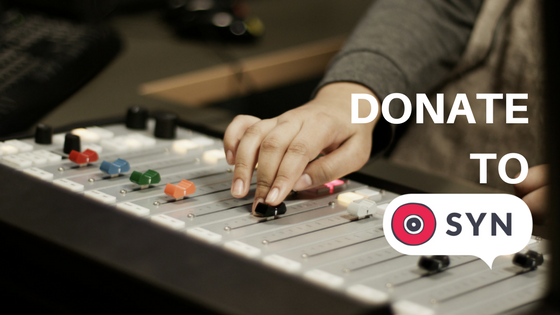 More than 5000 young people engage in SYN’s volunteer and training activities per year, allowing SYN to operate two 24-hour broadcast radio channels (SYN 90.7 on FM and SYN Nation on Digital) and produce a range of online audio, video and written media distributed via syn.org.au. Maybe you’re an alumni with a fancy job thanks to the skills developed and nurtured at SYN, maybe you’re a current SYNner who wants to go the extra mile in supporting your community, or maybe you’re the kind of person who believes young people should have a voice in the Australian media; whoever you are, donate today to help SYN engage more young Australians in media production and training! Financial donations to SYN are tax deductible, and are very much appreciated. From the current crop of SYNners, and on behalf of future generations, thank you. Why not become a regular donor to SYN? Giving a regular monthly donation online? Leaving a bequest to SYN? Email [email protected]. Perhaps you’ve got stuff we could use – can you donate the following items?